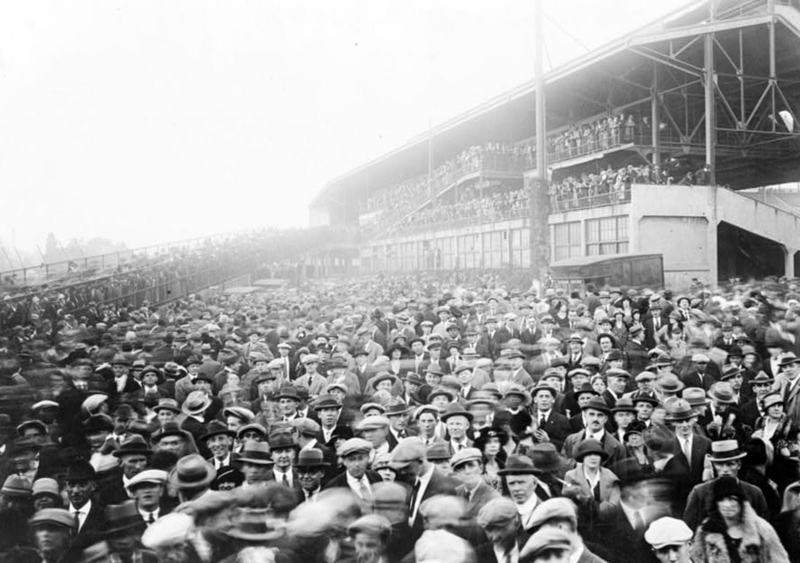 The 1924 World Series marked the fourth straight post-season appearance for the New York Giants and the first for the Washington Senators. Despite having Walter Johnson, who is still regarded today as one of the greatest pitchers of all time, the Senators had experienced limited success since the American League became a major league in 1901. John McGraw, now 51 years old and completing his 23rd season with the team, managed the Giants. 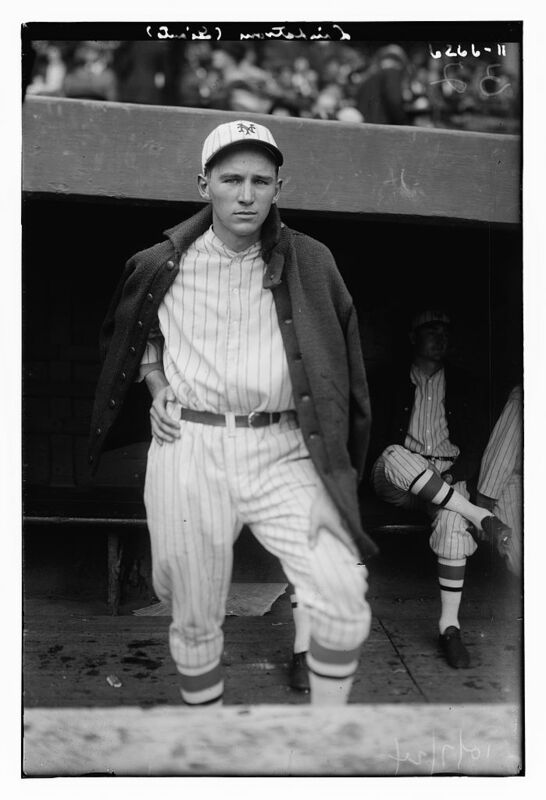 The Senators had a skipper known as the “Boy Manager.” Bucky Harris was 27 years old when given the job of manager to go with his duties at second base at the beginning of the 1924 season. Controversy shrouded the World Series on its eve. On October 1, Commissioner Kenesaw Mountain Landis placed New York outfielder Jimmy O’Connell and coach Cozy Dolan on the ineligible list for trying to bribe Philadelphia shortstop Heinie Sand to “not bear down too hard” in a September 27 game between the Giants and Phillies. The Giants won that game, 5-1, clinching the National League pennant as second-place Brooklyn lost to Boston. Sand reported the incident to his manager, who passed it on to league president John Heydler. Three other Giants—Frankie Frisch, Ross Youngs, and George Kelly—were implicated but cleared by the commissioner. Nevertheless, a cloud hung over the New York team for its attempt to get preferential treatment from another team during the pennant race. Two days before the opening game, a rumor circulated that the Senators would not be playing the Giants, that New York had been disqualified and Brooklyn would instead represent the National League in the World Series.1 The series went on as planned, with the Giants meeting the Senators, but American League President Ban Johnson, who had demanded the series be called off because of the scandal, refused to attend any of the games. However, Johnson—who had won 23 games during the regular season—was the losing pitcher in the 12-inning opener. He lost the fifth game as well, just two days before. It looked like he wouldn’t get the World Series win so many were hoping for. With Johnson unavailable, Bucky Harris had no obvious choice to pitch Game Seven. So he tried to deke McGraw. He started right-hander Curly Ogden, but planned to replace the 23-year-old in the first inning with the veteran George Mogridge, a lefty. Harris’s goal was to neutralize Bill Terry, the Giants’ left-handed first baseman, who was 6 for 12 in the series with a home run and a triple. Although Terry later became one of baseball’s best hitters, in 1924 McGraw was benching him against left-handed pitching. Harris hoped Terry would start the game, and then McGraw would pinch-hit for him when Mogridge came in. McGraw bit, putting Terry in a starting lineup that included seven future Hall of Famers. The strategy worked—sort of. McGraw did not replace Terry immediately after Harris made his switch. Harris even stuck with his ersatz starter longer than he had intended after Ogden struck out Fred Lindstrom on three pitches to start the game. It was here that Harris had planned to call for Mogridge, and Ogden even started walking off the mound. However, his manager called him back and told him to try another batter. This one—Frankie Frisch—walked, getting Harris to finally signal for Mogridge, the man he had really wanted all along. Mogridge retired Ross Youngs and George Kelly to end the inning and kept the Giants off the scoreboard for the next four innings. New York starter Virgil Barnes did even better in the early innings. Barnes retired the first 10 batters, five on strikeouts, when Bucky Harris stepped in with one out in the last of the fourth. On a 3-2 pitch, Harris hit a long fly that just cleared the low wooden fence in left field. Even Cal Coolidge rose and joined in on the prolonged applause that serenaded Harris as he trotted around the bases. Giants left-fielder Hack Wilson was shaken up on the play as he tumbled into the left-field pavilion in pursuit of the ball. Wilson stayed in the game and got to a liner from Sam Rice, the next batter, snaring it with a diving grab and hanging on as he slid on his stomach for another few feet. The Washington lead held into the sixth when Mogridge walked Ross Youngs to start the inning. Youngs was running on a 3-ball, 1-strike pitch to Kelly, who singled to center with Youngs going to third on the play. Bill Terry was up next, and at this point McGraw finally made his move by sending Irish Meusel up to hit for him. Harris countered by calling for right-hander Firpo Marberry. Who won this battle of managerial maneuvers can be debated, but McGraw was pleased with the final result as Meusel hit Marberry’s first pitch deep enough to right to bring in Youngs with the tying run. Wilson sent Kelly to third with another single to center. Travis Jackson then rolled a soft grounder to Joe Judge at first. Normally a sure-handed fielder, Judge bobbled the ball. Kelly had held up at third, but raced for the plate and scored when he saw Judge fumbling the ball. Jackson reached first safely on the error as the Giants took the lead. Things got worse for Washington when Hank Gowdy hit a grounder to shortstop Ossie Bluege. Rather than turning a double play to end the inning, Bluege had the ball roll through his legs. Wilson scored from second. Barnes, now with a 3-1 lead, continued to mow down the Senators. After Harris’s home run in the fourth, Barnes didn’t allow another baserunner for the Senators until Harris came to bat again three innings later. Harris opened the seventh with an infield hit but was wiped out when Rice grounded into a reverse-force double play. Goose Goslin followed with a single but was left at first when Judge flied out to end the inning. Art Nehf and Hugh McQuillan began warming up as the Senators came to bat in the last of the eighth, although it looked like they wouldn’t be needed as Bluege popped out to start the inning. But pinch-hitter Nemo Leibold pushed a fastball off the end of his bat. The ball grazed third base on its way down the left-field line, and Leibold hustled into second with a double. Muddy Ruel, who was hitless in the series, punched a grounder toward right. Kelly, now playing first, got his glove on the ball, but Ruel had a single and the Senators had runners at the corners. Bennie Tate hit for Marberry and walked to load the bases with one out. Barnes retired Earl McNeely a low liner to left as the runners held, and it looked as if he had worked his way out of the jam when he got Harris to hit a ground ball toward Lindstrom at third. “Harris didn’t hit the ball hard,” reported the New York Times, “but just as the grounder hit in front of Lindstrom, the pellet took a sudden leap, cleared the fielder’s head by a foot and rolled out to left field.”4 The bad-hop hit scored two runs. After Nehf relieved Barnes and Rice grounded out to end the inning, the Washington fans roared for two reasons. One was the game-tying rally. The other was for Walter Johnson, who was on his way to the mound for the ninth inning. The Big Train would again get a shot at a World Series win, one that would give his team the championship. However, Johnson quickly found himself in trouble, giving up a one-out triple to Frisch. He got out of it, though, by intentionally walking Youngs and then striking out Kelly on three pitches. Meusel then hit a grounder to third baseman Ralph Miller, who was saved by a great stretching catch of his erratic throw by Joe Judge. Like the Giants, the Senators threatened in the last of the ninth. Judge singled with one out. Bluege grounded to Kelly, who threw to second to try and force Judge. Shortstop Travis Jackson was late in covering, then dropped the throw and had it roll away as Judge made it all the way to third on the error. With Washington needing only a long fly to win, McGraw went to his bullpen, bringing in McQuillan to face Miller. After taking a ball, Miller hit a sharp grounder. It was right at Jackson, though, who made up for his error by starting an inning-ending double play and preventing the winning run from scoring. A dramatic inning had failed to produce runs, and the game went into extra innings. The Giants continued to put runners on against Johnson, who continued to work his way out of jams. He walked Wilson to open the tenth, then struck out Jackson and got Gowdy to ground into a double play. In the top of the eleventh, a single and sacrifice gave the Giants a runner at second with one out. Johnson then struck out Frisch and, after an intentional walk, fanned Kelly – as he had two innings before -- with the go-ahead run in scoring position. Irish Meusel led off the twelfth with a single, but the Giants could advance no farther than first base in the inning. As for the Senators, they went down in order in the tenth—although Johnson had sent a drive to deep center that was hauled in by Wilson—and got a two-out double by Goslin, followed by an intentional walk, in the eleventh off Jack Bentley, New York’s fourth pitcher of the game. Bluege grounded into a force out to end that threat. With the game still tied in the last of the twelfth, Miller led off for the Senators with a soft ground ball toward second. Frisch charged in, gloved it, and threw to Kelly in time for the out. Muddy Ruel lifted a pop fly behind the plate. Giants catcher Hank Gowdy had trouble with the ball from the start. He circled under it, then flung his mask away as he seemed to figure out the spot it would drop. However, at the last instant, Gowdy had to lunge to his right. He might have still made the catch if he hadn’t stumbled over his mask. Nearly falling to one knee, Gowdy dropped the ball. The error gave another chance to Ruel, who ripped a pitch inside third base and into left field for a double. The Giants missed a chance for the second out of the inning when Jackson booted Johnson’s grounder to short, although Ruel had to hold on the play. With one out and the winning run on second base, Earl McNeely—hitless in five at-bats in the game—stepped to the plate and hit a sharp grounder toward Lindstrom. However it got by, through, or over Lindstrom, the ball made it out to left-fielder Irish Meusel, who held the ball, declining to make even the gesture of an attempt to head off Ruel with a throw home. The Senators had their championship, Walter Johnson had his victory, and the citizens of Washington rejoiced on Pennsylvania Avenue and elsewhere through the night.